MAGISTRATE DANIEL G. PAPPAS was appointed Magistrate of the Allen Superior Court in November, 2013. Prior to his appointment, Dan was a trial lawyer who primarily practiced in the areas of family, criminal defense, and personal injury law. 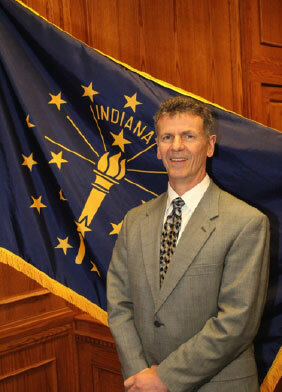 While in private practice, Dan served as the Chief Public Defender of DeKalb County, Indiana, since 2001. He also had an extensive practice in the area of Children In Need Of Services law and Juvenile Delinquency law, typically representing parents in Termination of Parental Rights actions, and also serving as the court-appointed guardian ad litem for children. He has previously been employed as the Chief Deputy Prosecutor for DeKalb County, Indiana, as a Deputy Prosecutor for Allen County, Indiana, and as a deputy Public Defender in both Allen County and DeKalb County, Indiana. He was active in the Allen County and DeKalb County Bar Associations, having served as a Board member of the Allen County Bar Association, and also on the Grievance and Fee Dispute Committees of that association. He is the past Board President of his neighborhood association, and has served on the Board of SAFY (Specialized Alternatives for Families and Youth) of America, a non-profit therapeutic foster care agency, as well as on SAFY’s Indiana Board. He also served on the Board of the Court Appointed Special Advocate (CASA) organization, whose representatives’ advocate for the needs of children in the community. Dan obtained his business degree from Indiana University in 1981 and his law degree from Indiana University in 1986.